I’ve known United States Olympic Committee (USOC) chief executive Scott Blackmun for over 15 years, and I have seen him, on occasion, enjoy a glass of good wine. I’ve also witnessed him enjoy a round of golf and a rugged game of squash with his friends, or mountain biking with his son. But those moments have been rare in the last 30 months for Blackmun, since he was chosen to lead the organization’s staff and programs in January 2010 by the USOC’s Board of Directors. Blackmun’s appointment comes almost a decade after frighteningly narrow-minded USOC volunteer leaders had shoved him aside for the top job to choose former Maytag chief Lloyd Ward. Blackmun left the USOC and Colorado Springs with his family to become a top executive with the Anschutz Entertainment Group in Los Angeles, a move that honed his many skills and leadership qualities before he moved to a law firm a few years later. He was the right man at the right time for the USOC this time, however, and what went down in Québec City during the 2012 SportAccord Convention proved it beyond measure. 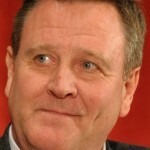 Blackmun and USOC chairman Larry Probst signed a new revenue-sharing agreement with the International Olympic Committee (IOC) that brought to a halt a protracted period of rancor, bitterness and unwarranted criticism of the USOC over its share of American network television fees and worldwide sponsorship revenues. By rights, Blackmun and Probst should be celebrating by enjoying a glass of Domaine Romanée-Conti – regarded as the most expensive win in the world or Petrus, served at their table by the smartly dressed sommelier, IOC President Jacques Rogge. The new agreement—which benefits both organizations—is, to be truthful, a huge “get” for the IOC, because it needs the USOC and its athletes, as well as the power of American television and its corporations, along with a future Games on United States soil, no matter what rhetoric the IOC has used. The old agreement, forged in the mid-1980s, gave the USOC a 12.75% share of U.S. television rights fees and 20% of TOP (The Olympic Partner) sponsorships. Trust me: the USOC deserved every penny of that deal, signed at a time when the organization faced an uncertain future, and was steamrolled over and over by the IOC. The new deal, which begins in 2020, now opens the doors to a possible U.S. bid for the 2022 Winter Olympics or a shot at the 2024 Summer Games by cities like Denver, Reno-Tahoe, Salt Lake City, Bozeman or Montana, or heavyweights like New York, San Francisco, Dallas or Los Angeles. Blackmun has protected the USOC’s vital revenue sources and secured funding for American athletes and member organizations through 2040. He knew from the start that whatever the USOC gave back, it needed to preserve its revenues as the only National Olympic Committee in the world that does not enjoy Federal Government support. IOC and USOC officials declined to give specific figures of the agreement at the resulting news conference, but details of the terms have been published on insidethegames. The USOC will retain the revenue it currently receives but its television rights share will be reduced to 7% on any increases in broadcast deals and its marketing share cut in half to 10% on increases in sponsorship revenue. The USOC agreed to contribute to the administrative costs of staging the Olympics—$15 million through 2020 and $20 million after 2020, the officials said. The contract also covers issues related to ownership of Olympic rights, trademarks and historic television footage. The old agreement, created at a time when the USOC was facing huge revenue challenges and burdened by U.S. television agreements which hindered its own domestic fundraising and sponsorships, was crafted by men who, like Probst and Blackmun, were resourceful and intelligent leaders: William E. Simon, F. Don Miller, John Krimsky, George Miller and Robert Helmick. They had a much different world to operate in then. The income-sharing agreement reached at that time helped the USOC in its ability to raise funds, and followed the successful 1984 Olympic Games in Los Angeles, which arguably saved the Olympic Games and the IOC for the future. The younger USOC had ponied up a guarantee of $25 million in 1980, that it really did not have, to keep the Games in Los Angeles when citizens threatened the Games’ funding. It had also endured the boycott of the Games in Moscow in 1980, forced on it by President Jimmy Carter’s administration, which damaged the USOC’s ability to raise its needed funds and its sponsors. America had carried out a great 1980 Winter Games in Lake Placid and produced the best moments of those days: the famed “Miracle on Ice” victory for the U.S. men’s ice hockey team over the all-conquering Soviet Union and speed skater Eric Heiden’s unprecedented five gold medals. In fact, the boycotts almost bankrupted the USOC. And if it had where would the IOC and the Games be now? American television and corporations became the backbone of IOC revenues, and the nation proved its worth over the years by staging successful games in Los Angeles in 1984, Atlanta 1996 and Salt Lake City 2002. All that the USOC and the U.S. had done for the Olympics was seemingly forgotten all at once, and the truth of history was shoved aside. America has hosted the Summer and Winter Games eight times, the most of any nation, and its athletes have given the Games some of their greatest moments and memories. In recent years, the targeting of the USOC as greedy and selfish, out of touch with the rest of the world, and accompanied by a steady drumbeat of criticism over its share of the money grew to a cacophony of noise; it came at a time when the USOC was especially vulnerable and in disarray because of management and leadership turnover and scandal. The issue was blamed by some as a huge reason that bids by New York for 2012 and Chicago for 2016 were thrown under the bus by the IOC in early round voting. But now, it’s all warmth and positive feelings between the USOC and the IOC. Blackmun, who inherited the mess of a decade lost when he came aboard in 2010, was typically quiet in the aftermath of one of the most significant moments in the grand history of the USOC, which was founded in 1894 in a smoke-filled New York City club. He and Probst have travelled the world for the last two years, forging new friendships and rebuilding others lost. They have created a new image for the USOC as a partner in the Olympic Family. The IOC and the USOC, but most importantly American athletes, are all winners. And Blackmun can come home to Colorado Springs and enjoy a glass of wine and a nap before he leaves again in the run-up to the Games in London. He now joins another Colorado Springs guy, USOC President Emeritus Bill Hybl, in the ranks of those who stood up for the USOC when it needed them the most. This article first appeared on May 25 in the blog, Insidethegames.biz. This blog is sponsored by the organizing committee for the upcoming Summer Olympics in London. The article is reprinted here with express permission. The blog can be accessed by going to http://insidethegames.biz. Mike Moran was the chief spokesman for the United States Olympic Committee for a quarter of a century, through 13 Summer and Winter Olympic Games, from Lake Placid in 1980 to Salt Lake City in 2002. He joined the USOC in 1978 and served as the senior communications counselor for NYC 2012, New York City’s Olympic bid group, from 2003-2005. He is now a media consultant. Previous articleIs Practicing Good Sportsmanship a Dying Art?